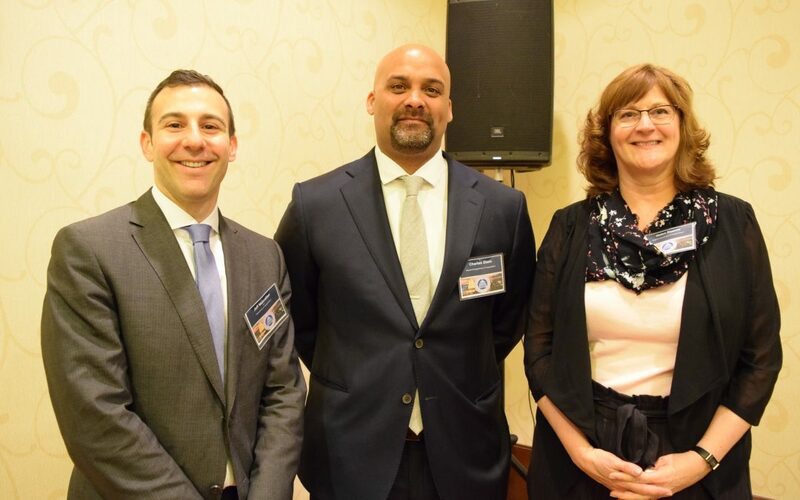 Left to right: Jeff Marootian, director of the District Department of Transportation; Dr. Charles Glass, assistant secretary, Maryland Department of Transportation; and Helen Cuervo, Northern Virginia district engineer, Virginia Department of Transportation. Top executives from the Virginia, Maryland and District of Columbia transportation departments addressed upcoming market opportunities for small, women-owned, and minority-owned businesses at the Metropolitan Transportation Opportunities Conference, April 27, in Arlington, Virginia. Nearly 200 people attended the annual event, co-hosted by ARTBA’s local chapter, the Metropolitan Washington Road & Transportation Builders Association (MWRTBA), and DBE Advance LLC. The Washington, D.C.-based firm helps connect smaller companies with government agencies, prime contractors, and service providers working on major infrastructure projects in the region. Helen Cuervo, P.E., Northern Virginia district engineer for the Virginia Department of Transportation (VDOT), said the commonwealth has several “mega” transportation projects on the horizon, including routes 66, 395 and 495 Express Lanes projects. She said Virginia offers small business opportunities ranging from administrative services to trash debris removal and landscaping. Dr. Charles Glass, assistant secretary for the Maryland Department of Transportation (MDOT), noted the state’s three transportation business units all have Disadvantaged Business Enterprise (DBE) participation goals of at least 25 percent for fiscal years 2017-2019. D.C. District Department of Transportation (DDOT) Director Jeff Marootian said his agency is focused on safety as the city grows by 1,000 residents a month. The District’s Vision Zero program aims to reach zero transportation system fatalities by 2024 through the effective use of data, education, enforcement and engineering. More information about each agency’s DBE, Minority Business Enterprise (MBE), or Small Business Enterprise (SBE) programs, and how to bid on projects, can be found on the MDOT, VDOT and DDOT websites. For more information on MWRTBA, contact Executive Director Mike Sakata.